Chocolate Biscuit: Whip egg yolk and 10g of sugar for ten minutes and add vegetable oil. When you get a solid consistency add some flour, cacao, and milk. Then whip the egg whites with the sugar leftover and add it to the major mixture. Halve the chocolate mass into two 1cm thick parts and bake on 180C for 10 minutes. When biscuit gets cold cut out the square of 15x15 size. Apple: Keep the apple skins and cut them into long pieces, clean from seeds. Prepare caramel from sugar, add cinnamon and crème butter. 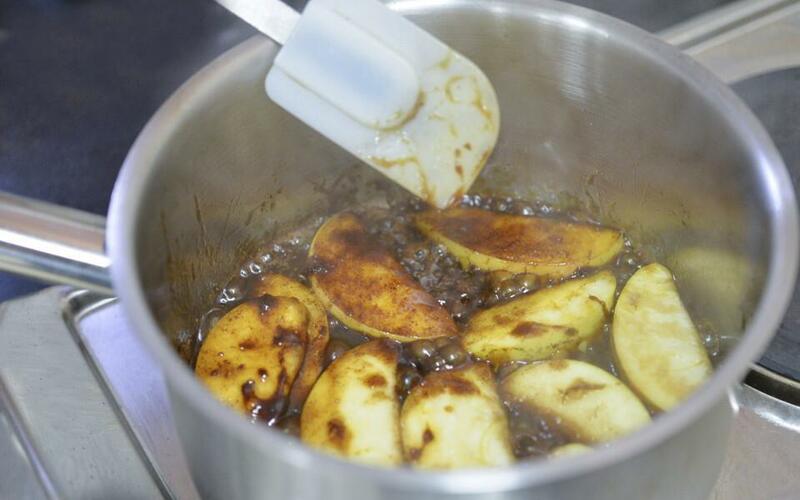 Add apples and stir until the apple softens, but it shouldn't turn into the puree. Give some liquor in the end and stir well. Move everything on a riddle (you can keep the syrup and cover the biscuit) and let it drain. Cover the 15x15 size tray with a baking paper and place apple pieces on it. Green apple mousse: Soak the gelatin in some water to dissolve. Peel the apple, get rid of seeds, cut into squares and toss in the blender together with lemon juice, rum, and sugar. Heat the mixture on about 60C and add the swollen gelatin. Cool them down to 28C and mix with whipped crème. 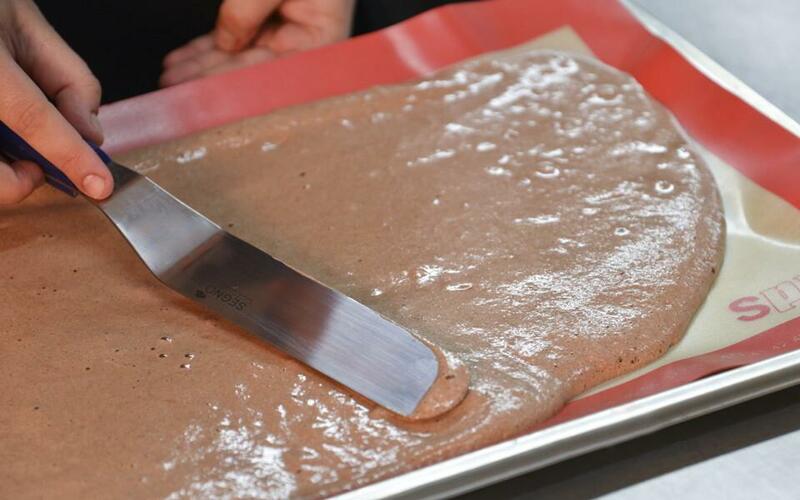 Immediately apply the mousse on apple pieces and evenly divide. Top them with the first chocolate biscuit and press it. Caramel: Bring the crème to boil and keep it hot until the usage. Prepare caramel from sugar and water and add hot crème while still being caramelized and mix them up. 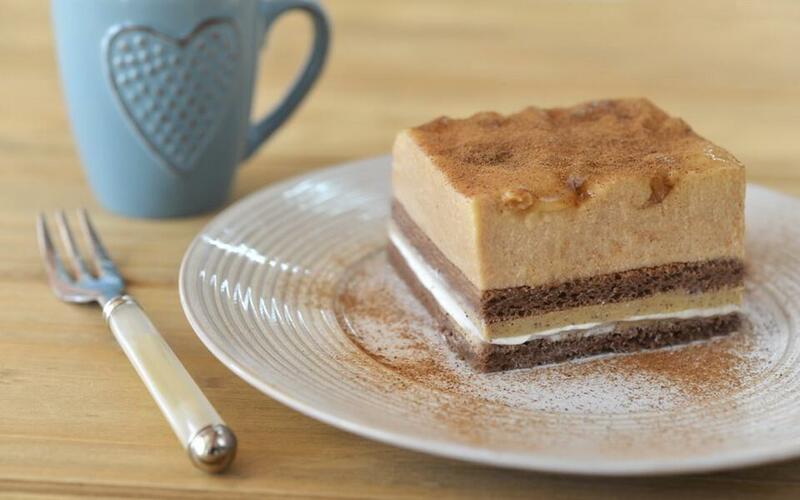 Caramel mousse: Soften the gelatin in cold water and let it dissolve. Add cinnamon to the already prepared mixture and combine it with crème caramel and warm it up. 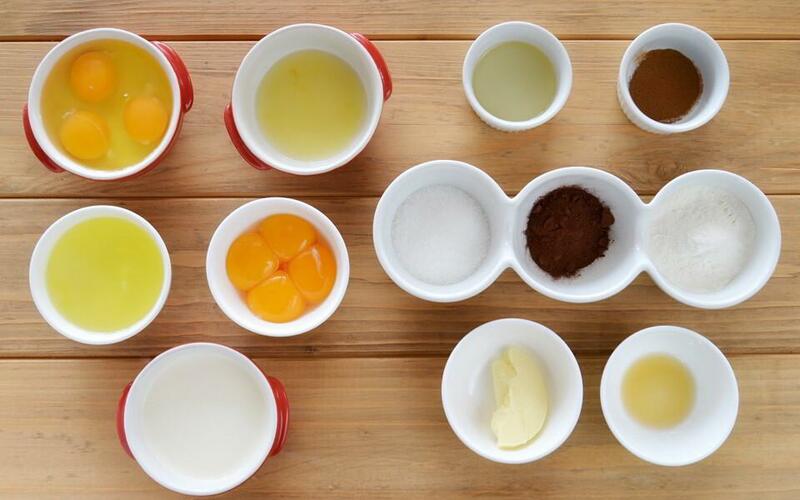 Add egg and sugar to the mixture and move them all to the deep bowl and make an English cream on 83C. 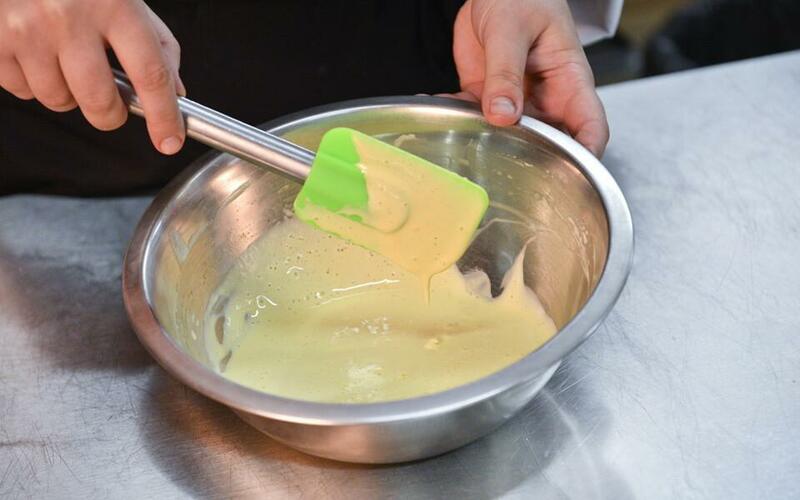 When ready move it to the clean utensil in order to stop the process of boiling and add gelatin and blender. Then cool it down to 25C and mix with the whipped crème. Place the final product on the chocolate biscuit, evenly divide and top with another chocolate biscuit and press well. Keep the cake in the fridge. Serving: Turn the cake upside down in the morning, take off the frame and glaze it.